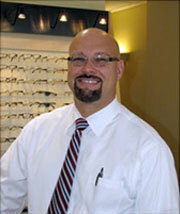 Dr. Thomas Handel graduated with honors from The Ohio State University College of Optometry in 1987 at the age of 23. He was one of the youngest to graduate from the college. After graduation he returned to Northeast Ohio. Dr. Handel purchased Arlington Eye Care in 1991. The growth of Arlington Eye Care led Dr. Handel to open The Handel Vision Clinic in Fairlawn. Professionally, Dr. Handel prides himself on keeping up with technology that will enhance the eye exam experience for the patients and help the doctors evaluate your eyes accurately. He is a member of the Optometric Honor Society Beta Sigma Kappa, the American Optometric Association and the Ohio Optometric Association, and the American Academy of Orthokeratology and Myopia Control. In addition to being an avid Buckeyes fan, Dr. Handel keeps busy by spending time with his wife, Krista and their 4 children. Every year Dr. Handel raises money for the Multiple Sclerosis Society by participating in the Buckeye Breakaway, a 150 mile bike ride. Dr. Handel will be in Green on Mondays and Thursdays, and in Fairlawn on Tuesdays, and Friday mornings. He will be in Newton Falls on Wednesday.